Jinjiang Inn Xi'an Big Wild Goose Pagoda is located at the northeast corner of northern square of the famous tourist attraction Greater Wild Goose Pagoda, opposite to Party School of Municipal Committee on Xiying Road, and adjoining Guangcai Lamp City in the west and Western Film Group in the east. It takes only 20 minutes to reach the Hotel by taking Bus Line 41 from Xi'an Railway Station and getting off at Party School of Municipal Committee Stop. From Xi'an North Bus Station, you can take Metro Line 2, get off at Xiaozhai Station, transfer to Bus Line K19, K400 or 34 to directly reach and get off at Party School of Municipal Committee Stop, then you will reach Jinjiang Inn Xi'an Big Wild Goose Pagoda. By taking Airport Shuttle Bus from Xi'an Xianyang International Airport, you can reach the following stops: Xiaozhai, Railway Station and Bell Tower, and it takes only 50 minutes or so. From Bell Tower, take Bus Line K609 to reach the Hotel; from Railway Station and Xiaozhai, take Bus Line K19 and 41 to reach the Hotel; and it takes only 10-15 minutes to take a bus. N reasons for you to choose the Hotel for study, business, travel and trip purposes: Convenient transportation: in the Hotel's surrounding area, there are over 70 bus lines with direct access to various major tourist attractions. The Hotel is 5mins walk from Greater Wild Goose Pagoda, Cien Temple, music fountain, Tang Dynasty Dacien Temple Relics Park, and Tang Dynasty Tongyi Lane; The Hotel is only 5mins drive from Shaanxi History Museum. By walking for 15 minutes from the Hotel, you can reach Shaanxi History Museum; Take one of the many bus lines such as Bus Line 21, 22, 27, 715, 601, etc. from the Hotel, you can directly reach the national 5A tourist attraction Tang Paradise, Qujiang Pool Relics Park, Hanyao Relics Park, Relics Park of Mausoleum of Qin Second Emperor, Xingqing Park, Qujiang Ocean World, Botanical Garden and other famous tourist attractions; The Hotel is only 15mins walk from Saige Computer City, Buynow and Dongxin Tech & Trade, and it takes only 5 minutes to take Bus Line 41 or K606 there. Take Bus Line 21, 224, 521 or Tourist Line 8 from the Hotel, then you can reach Small Wild Goose Pagoda; at the Hotel's gate, take Tourist Line 9, you can directly reach Qinling Wild Life Park. Walk from the Hotel to West Beiguagnchang Road of Greater Wild Goose Pagoda and take Famen Temple Special Line, then you can directly reach Famen Temple in Baoji, China, or take Ring Tourist Bus, then you can enjoy the beauty of Qinling Mountains landscape. By take Bus Line K606 or K609 from the Hotel's gate, you can directly reach Drum Tower, Hui People Street Snack Street, Ancient City Wall and Stone Tablets Museum. By taking Bus Line 306 (i.e. Tourist Line 5) from the railway station, you can reach Buried Sculpture Legion, Huaqing Hot Spring and Qin Imperator Mausoleum; by taking train or bus from the railway station, you can reach Mount Hua. Rich recourses: location in Greater Wild Goose Pagoda scenic spot. Shopping: Century Jinwa, Minsheng, Parkson, Yintai International Shopping Center, Qinhantang Business District; Business: Qujiang Convention Center (it takes only 10 minutes to take Bus Line K19, 408 or 44 there), Provincial International Exhibition Center (it takes only 15 minutes to take Bus Line 521, 701, 610 or Tourist Line 6 there); Food: Tang Dynasty Tongyi Lane Bars and Catering Street, Qinhantang Catering Plaza, Xiaoliu Steamed Dumpling, Pizza Hut; Entertainment: Qujiang International Cinema, Jackie Chan Cinema, Xi'an Concert Hall, Pacific Cinema, Super Music Star; Supermarket: Century Jinwa, Yintai International Shopping Center, Vanguard, Wal-Mart, Watsons; Bank: Bank of China, Industrial and Commercial Bank of China, Agricultural Bank of China, China Merchants Bank, China Construction Bank, Postal Savings Bank of China, Bank of Communications, etc. ; numerous schools: the Hotel is located in the sea of knowledge University: Xi'an University of Architecture and Technology, Huaqing Campus of Xi'an University of Architecture and Technology, Chang'an University, Xi`an University of Science and Technology, Xi'an Conservatory of Music, Xi'an Jiaotong University Financial Services Institute, Xi'an Jiaotong University, Qujiang Campus of Xi'an University of Technology; Senior high schools, junior high schools and primary schools: the High School Affiliated to Shaanxi Normal University, No. 85 Middle School, Chang'an University Affiliated School, Qujiang No. 1 Middle School, No. 4 Middle School, Yucai Qujiang Primary School; Meeting affairs: the meeting room has an area of 40 square meters, and can accommodate 30 people at most; Catering: the cozy and comfortable Xinglianxin Cafe allows you to enjoy delicious and safe dishes without going out. Free access of local call: we provide free local call and the domestic long-distance call at RMB 0.77/min. Cultural characteristics: free WIFI access at the lobby and full coverage in restaurant. The rooms are provided with 20M high-speed optical network for enjoying the unique culture of Jinjiang. The Hotel is accessible to foreigners. 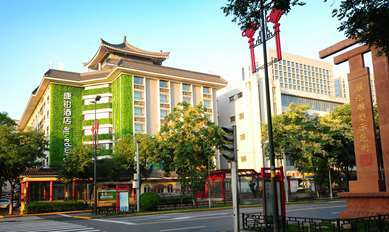 Choose Jinjiang Inn, live assured in your travel everywhere, you deserve it...! Welcome to Jinjiang Inn Xi'an Big Wild Goose Pagoda. Query, left luggage, valuables deposit, umbrella renting, laundry service, morning call, business center, etc.